Wario Blast: Featuring Bomberman! (Japanese: ボンバーマンGB, Bonbāman Gēmu Bōi) is a crossover game between the Wario franchise and Hudson Soft's Bomberman series that was released in 1994 and 1995 in North America and Europe, respectively. The game is a reskinned version of Bomberman GB, which was released in Japan in August 1994. The Wario series theme was exclusively added to Western releases. Aside from Wario's presence, the game is mostly unchanged and plays like other Bomberman titles. The Bomberman GB released in the West is actually the Japanese Bomberman GB 2. The player takes the role of either Wario or Bomberman and fights against up to three copies of the other character. Wario's goal is to rob Bomberland, while Bomberman's is to protect it. In every round, the player has to defeat the enemies by strategically placing bombs, while they are able to do the same. Title screen, as played on Super Game Boy. WARIO INVADES THE LAND OF THE MADBOMBERS! ted flunkies he originally thought them to be! 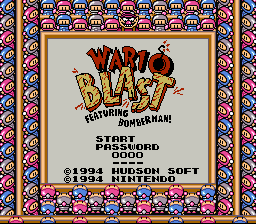 The player can choose to play as either Wario or Bomberman, but this doesn't change any aspects of the game, minus reversing the passwords. There are eight rounds in total, including three regular levels and one boss level each. The game shares its objective with other Bomberman games. The player has to blow up between one to three opponent(s) via the use of bombs to advance, while they try to do the same to the player. The entire game has an eagle-eye perspective. The player maneuvers around a grid-like playing field, setting off bombs to blow up unsuspecting enemies, and destroy walls to clear the way and to reveal occasional power-ups. The player wins by defeating the enemy Madbombers (which take on the appearance of the character not chosen). Every level is played with a best of 3 rule. If the player wins two times they gain access to the next level. Failure to do so results in a Game Over. When playing the game on the Super Nintendo Entertainment System with a Super Game Boy, an additional multiplayer mode for up to four players is available. In this mode, multiple people are able to play against each other. The additional two players on top of the default two players that a SNES can support needs the Super Multitap. At the end of each world, the player faces a boss. A certain strategy is required for each of them. The following list uses the names from Nintendo Power's coverage from the game in Volume 67, with the exception of Pukupuku and Gururin Knight, whose names come from the original game Bomberman GB. Wario Blast: Featuring Bomberman! isn't directly referenced in later games, but it began a trend in Nintendo spin-offs that associates Wario with bombs. Technically, bombs having any relevance to Wario first appeared in Wario's Woods, but in this game, they are solely used against him. Beginning in Mario Party, Wario has an association with Bob-ombs as his home stage, Wario's Battle Canyon, features the landscape of a canyon wrought with explosions from a war between Bob-ombs and Bob-omb Buddies, which Wario appears to be manipulating out of greed. In Mario Party 3, Wario's association with Bob-ombs continues, as one is his default partner in the game's duel mode. In Mario Tennis, Bob-ombs line the walls in Wario's home stage, Wario Court, as well as his joint venture with Waluigi, Wario & Waluigi Court. In Mario Kart: Double Dash! !, Wario's special item is the Bob-omb. In Super Mario 64 DS, Wario is one of the two characters who has a Bob-omb themed minigame in the Rec Room. In Mario Hoops 3-on-3, Wario's home stage Wario Factory has several Bob-ombs (ones larger than the Bob-omb one gets as an item) that appear as stage-exclusive hazards for the players. In Mario Super Sluggers, Wario hits a bomb in addition to a baseball as his special move. In the Club Nintendo comics, Wario is the owner of a bomb shop. Lastly, the timer and logo for the minigames in the WarioWare games is a bomb called the Bomb, with Wario's mustache on it. 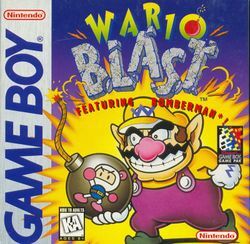 ↑ Wario Blast: Featuring Bomberman! instruction booklet, pages 4 & 5. This page was last edited on April 21, 2019, at 07:21.